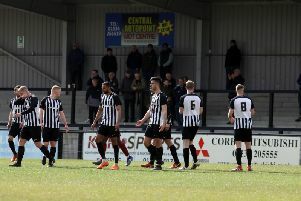 Edi Appleton says the Corby Town players must “step up to the plate” in the next two matches if they are to haul themselves out of trouble in the Vanarama National League North. The Steelmen head to AFC Telford United on Saturday sitting rock-bottom of the table and five points adrift of safety with just nine games to play. The trip to the New Bucks Head is followed by a home clash with another of their fellow strugglers Hednesford Town on Easter Saturday. Corby halted a run of three successive defeats with a 0-0 draw at play-off chasing Tamworth last weekend. Central defender Appleton knows the situation at the bottom will change quickly if Corby can pick up a much-needed victory on Saturday. But it is likely to be a tough task for Corby against a Telford side who have pulled away from the relegation zone in recent weeks. The Bucks go into the clash on the back of a four-match unbeaten run and three wins in a row, with the latest being a superb 1-0 success at promotion-chasing Harrogate Town last weekend. And Appleton said: “It goes without saying how big these next two games are. “Telford are on a bit of a roll and that has not gone unnoticed. “It will be a tough game. I didn’t play against them in the home match (which Corby won 3-2 in November) but they have obviously made changes and they will be well organised. “I think the manager (Tommy Wright) knows he has a group of lads who are ready to fight for it. “We feel we have enough in the squad to do it and that’s probably the most frustrating thing because the reality is that we are down there. “Nobody can go missing and we all need to step up to the plate. Appleton believes the Steelmen can take confidence from their performance and result at The Lamb last weekend. And he also had a word of praise for young goalkeeper Sam Donkin who made some crucial saves to help preserve the clean sheet. “I think the result at Tamworth has given us more confidence but we can’t get carried away by it because we didn’t score and we didn’t win,” Appleton added. “But to keep a clean sheet was great and I thought Sam Donkin was class in goal. “It’s great as a defender to know you have a goalkeeper like that behind you.